About a month ago I walked together with Per Skoog, a recently pensioned forester, through his own private forest-property close to his home in Nyhammar, Sweden. It was a beautiful day for a walk, with a pristine nature and a knowledgeable guide taking me through lands he knew as his own pocket and loved as his own home. We walked through Malingarna, a gorgeous ridge meandering through a lake and carried on along its outlet, the Norrbo-stream. We passed Mångdala, an old wooden house now used by the scouts, beautifully built and set next to the stream. But through our talks there was a sense of urgency; a feeling that time is short for our attempts to protect the vulnerable nature and the culture it supports. It is in a delicate balance. We need to act – but what should we do? What do we need to do first in order to secure what we still have? Today this image appears in the media. 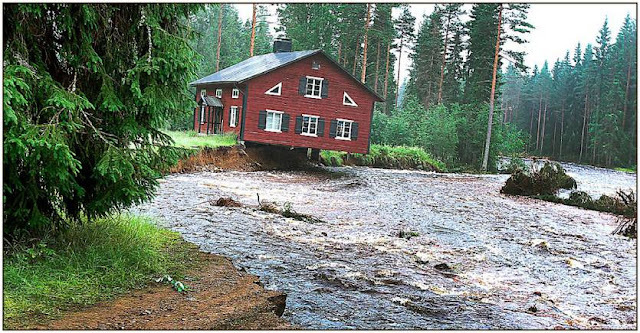 Mångdala scout-house on its way down the Norrbostream after an exceptional torrential downpour. And the path we walked on is no longer there. It feels almost over-stated. Thanks a lot. We get it. It is time to realize that the house we have built – our whole culture – is built on loose sand! It is built on premises that aren’t sustainable: it is built on the thought that we are above nature and can exploit it for our own gain. It is built on the premise that if we only dump our inconveniences far away enough we are not being disturbed by it. It is built on the premise that we can live well on the capital of our children and let them pay the bill in the end. It is built on an economy that lost its contact with reality a long time ago. We need pictures like this to wake us up. The situation is precarious. It is up to you or me what way it will go. It depends on what side of the house we are in. Are we on the side that tilts it towards the abyss or are we on the side that makes it more stable? My walk has opened my eyes for my own responsibility in this. It does matter what I do and where I am. Maybe it is precisely I and where I place myself that makes the difference if the house will tip over or not! We walk the Path, through the torrential downpours, with an even greater dedication. On what side are you? Join us now!